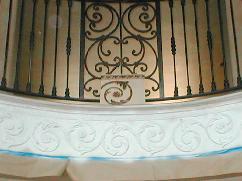 As authorized J.P. Weaver design and installation specialists we offer complete design, consultation and installation of composition and Petitsin resin ornamentation. 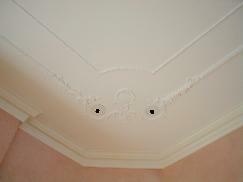 Motifs available range from classic French and European designs to English and Tudor. 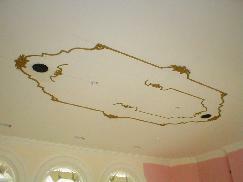 Below are illustrations of our most recent installations. 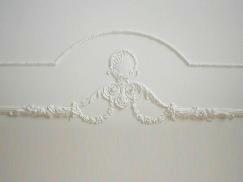 J.P. Weaver Composition and Petitsin resin ornamental appliqués and lineal trims are completely pliable, moldable and layer-able during installation, and cure to a hard durable paint ready finished "sculpture". 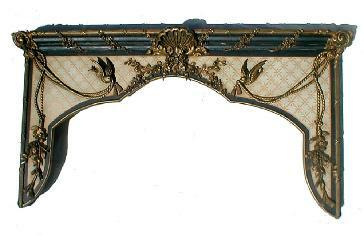 There are hundreds of molds for creating nearly unlimited combinations of appliqués including scrolls, acanthus leaves,rosettes, garlands, shells, flowers, and dozens of lineal molding details. 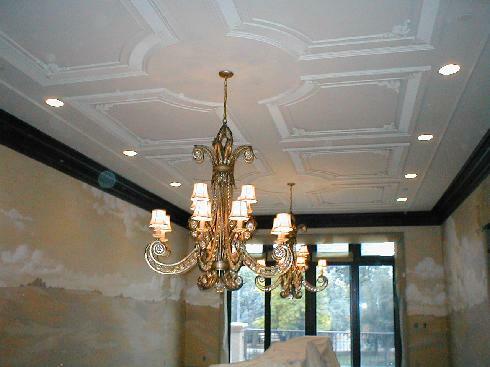 They can be combined with plaster, wood and other resin based ornamentation and moldings for amazingly intricate and detailed custom treatments. entire pieces is then antique washed. 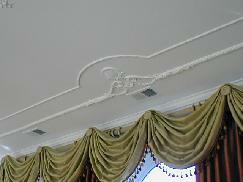 Used as a cornice on a window it adds dramatic architectural elements. 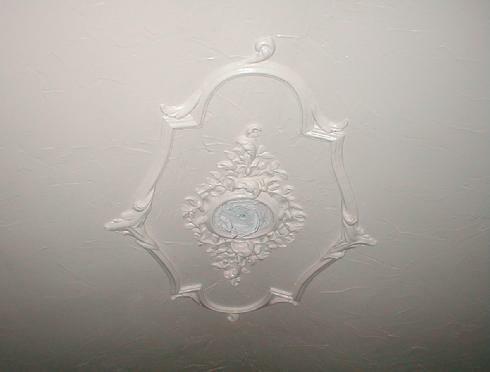 an existing dome vault (shaded area) which will also be enhanced with ornament. composition ornament and a distressed painted finish. showing some composition ornament in various states of completion from raw to primed and ready for finish painting. Click on an image to enlarge the picture album. 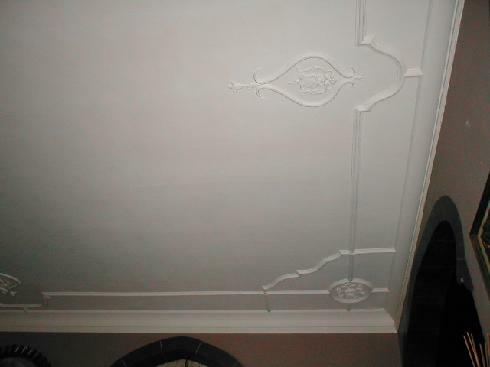 Completed ceiling treament ready for decorative paint work. and to "disguise" the ceiling speakers and can lighting. A sample board illustrating different finish treatments to achieve several exciting results. A simple but effective combination of wood moldings with decorative composition ornament corners and center chandelier medallian. The walls are glazed on 2 tones of french blues. overlays. It adds a definition of space for the dining area in an open plan high rise condominium. 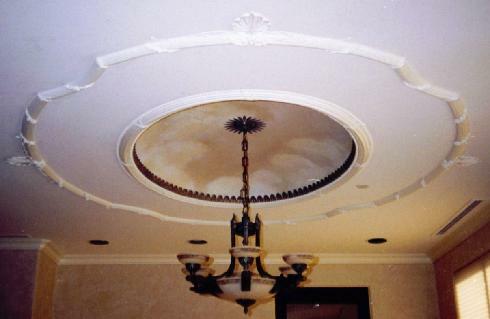 As an authorized J.P. Weaver design and installation specialist we offer complete design, consultation and installation of composition and Petitsin ornamentation. 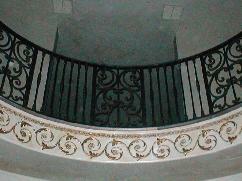 Motifs available range from classic French and European designs to English and Tudor. added on a fireplace in a 1960's home where there was only a painted shelf, hearth and surround.